Boston Dynamics has unleashed its latest creation: the WildCat robot capable of running 16 mph. Boston Dynamics, an engineering company specializing in advanced robotics and software for human simulation, just unleashed its latest creation: the WildCat robot. According to PCMag.com, the four-legged WildCat is a multiterrain robot that is not tethered to a power source. 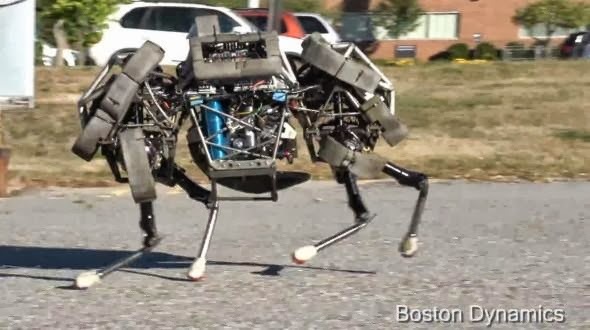 The WildCat is based on the Cheetah robot, another Boston Dynamics creation that PCMag.com described at the fastest legged robot in the world, capable of reaching a speed of 28 mph on a treadmill while tethered to a power source. Development of the WildCat is being funded by the Defense Advanced Research Projects Agency, or DARPA, a U.S. Defense Department agency that conducts research and develops new technology for military use. Boston Dynamics is also responsible for the Atlas, a 6-foot 2-inch, 330-pound humanoid robot, according to PCMag.com. Other robots by the Waltham, Mass.-based tech company include the BigDog, a three-foot-long robot weighing 240 pounds; the LS3, a four-legged robot designed to carry as much as 400 pounds of gear for soldiers, as well as fuel for a 20-mile mission lasting as long as 24 hours; and the SandFlea, an 11-pound robot capable of jumping 30 feet in the air. There’s no denying the eeriness of seeing these robots in action. Most of them look as if they’re straight out of a dystopian science-fiction film. But, as Geek.com pointed out, the potential for using these robots in military situations is too great to ignore, which means DARPA will continue to fund Boston Dynamics in its effort to develop advanced robot technology.